The US-Pakistan joint statement reaffirmed "enduring U.S.-Pakistan partnership" for "a prosperous Pakistan, and a more stable region." It commits the two sides to work "jointly toward strengthening strategic stability in South Asia". The statement further said that "President Obama expressed support for Pakistan’s efforts to secure funding for Diamer­ Bhasha and Dasu dams to help meet Pakistan’s energy and water needs." Referring to the strained India-Pakistan ties, the statement said that both leaders "emphasized the importance of a sustained and resilient dialogue process between the two neighbors aimed at resolving all outstanding territorial and other disputes, including Kashmir, through peaceful means and working together to address mutual concerns of India and Pakistan regarding terrorism". There are also media reports indicating that President Obama has decided to sell 8 new F-16s to Pakistan. Mr. Obama has also pledged $900 million in assistance to Pakistan for 2015-16. In addition, both Washington Post and New York Times have reported that the United States wants to negotiate a civil nuclear deal with Pakistan. Pakistan has said it will not accept any conditions that limit its nuclear weapons program in exchange for a civil nuclear deal with the United States. As expected, India has reacted with anger to references to US support for strategic stability in South Asia region, support for Diamer Bhasha dam financing and resolution of Kashmir issue through peaceful means. The reports of F-16 sale to Pakistan and possible US-Pakistan civil nuclear deal have also elicited a strong negative reaction in New Delhi. The US-Pakistan joint statement and several White House fact sheets have detailed US-Pakistan cooperation in education, energy, trade and investment, defense, cybersecurity and counter terrorism. Under the U.S.-Pakistan Clean Energy Partnership, the United States said it "will work with the Government of Pakistan to advance energy sector reforms, improve the investment framework, and make targeted investments that will enable U.S., Pakistani, and international private sector developers to add at least 3,000 megawatts (MW) of clean power generation infrastructure to Pakistan’s national electricity system, benefitting 30 million Pakistanis". Under the Education partnership, the United States, through the U.S. Agency for International Development (USAID), committed $70 million to work jointly with the Government of Pakistan and other partners to help educate and empower more than 200,000 additional adolescent girls across Pakistan. The United States is already funding three centers for advanced studies for agriculture, energy and water under the education partnership. The Center For Advanced Studies in Agriculture is at the University of Agriculture in Faisalabad, the Center For Advanced Studies in energy at Peshawar University and the Center For Advance Studies in water at Mehran University. These centers are working with major US universities. Under Trade and Investment Partnership, the United States will help upgrade the capabilities of the ready-made garments (RMG) sector through support of vocational centers dedicated to RMG and improvements in industry labor conditions. U.S. assistance will also help scale-up Pakistan’s International Labor Organization (ILO)-International Labor Standards (ILS) Textile program and support the launch of an ILO “Better Work Program.” Also, the United States will support an investment event in New York to highlight opportunities in Pakistan’s RMG industry and other sectors. The Office of the U.S. Trade Representative will assist the Government of Pakistan in identifying and petitioning for additional GSP tariff lines and to obtain eligibility for exports of goods under newly GSP-eligible travel goods tariff lines. The latest Obama-Sharif Summit in Washington has cleared up any confusion that may have been created by the continuing US troop withdrawal from Afghanistan and the expiration of Kerry-Lugar Bill. The US-Pakistan joint statement has firmly established continuing US interest in maintaining close ties with Pakistan. Pakistan's strategic location makes it attractive to both the United States and China, the world's two largest economic and military powers, to maintain close ties with it. What comes out of these ties will ultimately be determined by how well the Pakistani leaders leverage them for maximum benefit for the well-being of the people of Pakistan. After reluctance shown by World Bank and Asian Development Bank (ADB) to finance Bhasha Dam, Pakistan is considering different options including seeking multi-billion dollar loan from China and launching bond to attract overseas Pakistanis for investing in it. “We are considering unbundling Bhasha Dam into construction of hydropower Dam then power turbines will be built into IPPs mode. We had already invested Rs100 billion on acquisition of land for Bhasha Dam,” official sources confirmed to The News here on Sunday. Federal Minister for Planning Ahsan Iqbal told ‘The News’ that the groundbreaking ceremony of Bhasha Dam would be held during the next calendar year 2016. He said that one Chinese company showed its interest to invest $40 to $50 billion in hydropower projects and currently they were conducting their feasibility studies to select projects. He said that the government was also actively considering launching international bond to attract overseas Pakistanis for investing into this project. It is our endeavour to complete this project at all costs, he added. One option is to seek assistance from China inside or outside the China Pakistan Economic Corridor (CPEC) for which Beijing had committed $46.2 billion for energy and infrastructure projects over medium to long-term basis. The WB and ADB were not ready to finance Bhasha project owing to different excuses but the main hurdle was objections raised by New Delhi on this project. So the options are limited as US had also indicated to provide financing but they have not so far delivered their promises in the past few years. According to the technical feasibility for Diamer-Bhasha Dam Project, prepared by Wapda, the installed capacity would be 4,500MW. There will be 12 units having capacity of 375MW each and the average annual generation of the Dam will be 19,000GWH. The Diamer-Bhasha Dam project is located on Indus River about 315 km upstream of Tarbela Dam, 165 km downstream of Northern Areas capital Gligit and 40 km downstream of Chilas. On the main Dam, the type of the Diamer-Bhasha Dam will be Roller Compacted Concrete (RCC). The maximum height of the Dam will be 270 m (highest of its type in the world). On diversion system, there will be 2 number Diversion Tunnel (right side) and 1 number Diversion Tunnel (right side). Regarding main spillways, there will be 14 gates and the size of each gate will be 11.0 x 16.5 m.
On the reservoir side, the maximum operating level of Diamer Bhasha Dam will be EI 1,160m and minimum operating level of EI is 1060m. The Gross Capacity of the Dam will be 9.0 BCM (7.3 Million Acre Feet MAF). The live capacity of the Dam will be 7.9 BCM (6.4 MAF). Regarding the outlets of the Bhasha Dam, the technical feasibility illustrates that there will be 7 low level outlets and five sluicing. On sluicing tunnels, the Diamer-Bhasha Dam will have one right bank (through conversion of one diversion tunnel) and on the left bank there will be another tunnel. As expected, after what seemed to be a cordial two-hour marathon meeting between Nawaz and Obama, the joint statement focused on Pakistan’s agreement to take action against all terrorist outfits, including the Haqqani group and the Lashkar-e-Taiba (LeT). The promise that the groups would not be allowed to operate from Pakistani soil suggests that the bulk of the meeting was uni-directional with the US president making demands of PM Nawaz. Combined with a vague statement proposing confidence-building measures along the Line of Control with India and President Obama raising the ‘continuing threat of nuclear terrorism’, it seems Nawaz was made to listen more than talk. There was also no nuclear deal signed – something Pakistan has hoped for a long time, arguing that the civilian use of nuclear energy could greatly help us solve our power crisis. Singh: "Meanwhile back in. Pakistan: The visit - thenews.com.pk"
India on Friday took exception to the American appreciation for Pakistan’s anti-terror operations and the American pledge to provide eight F-16 aircraft to the Pakistan Air Force. Ash: "Best of luck if you want to keep nurturing LeT and Haqqanis. Don't blame India when they turn rabid. Some people never learn"
Modi and his Sangh Parivar are doing a much better job of terrorizing large parts of India than LeT or Haqqanis could ever imagine. The Obama administration is preparing to sell eight F-16 fighter jets to Pakistan in an attempt to bolster the two countries' relationship despite Washington's reservations about Pakistan's growing nuclear arsenal, said a report published on The New York Times (NYT) website. The aircraft sales, which the United States (US) Congress could block, would be a symbolic step given Pakistan's current large fleet of fighter jets. According to the NYT report, the Congress was notified just days ago about the proposed sale of the additional fighters although it is not clear if the White House plans to announce the sale of the aircraft during Prime Minister Nawaz Sharif's ongoing visit to Washington. The new fighter jets would add to Pakistan’s sizable force of fighter jets which includes more than 70 F-16s and dozens of French and Chinese attack aircraft, the report said. Earlier in April, the US State Department approved Pakistan’s request for a billion dollars worth of military hardware and equipment, identifying Pakistan as a country of vital importance for US foreign policy and national interests. In May this year, the US handed over to Pakistan over 14 combat aircraft, 59 military trainer jets and 374 armoured personnel carriers, Dawn newspaper had reported. The weapons supplied to Pakistan were earlier used by American forces in Afghanistan and Iraq. The NYT report says that many in the US Congress are concerned that the F-16 jets are more useful to Pakistan in its long confrontation with India than for counterterrorism operations. It is not certain whether the Congress will approve the deal. According to NYT, the Congress and the US State Department are already in a standoff over an effort to sell used Navy cutter vessels to Pakistan earlier this year. In March, the US House Committee on Foreign Affairs put a hold on about $150 million in foreign military financing. The committee said the cutters were not essential to fighting militants, NYT quoted American officials as saying. The decision of the sale of fighter jets comes ahead of Thursday's meeting between President Barack Obama and Prime Minister Nawaz Sharif. Obama is expected to press Nawaz on the Taliban, nuclear safety and a range of other issues when the troubled allies meet at the White House. Despite efforts to smooth divisions behind handshakes, smiles and items of agreement, long-standing security concerns are likely to dominate the Oval Office discussions. Islamabad's alleged ties with the Afghan Taliban, its alleged support for groups opposed to India and the US and its rapidly growing nuclear arsenal are seen by Washington as security headaches. Anon: " Both are good reads." Aatish Taseer, son of a Pakistani. Couldn't have expected better from him. He gives no fact, no sources, no thoughts nothing. Just simple stupid rants. His opinions are not based in reality and facts, many of the middle class and elites in India rub shoulders in Indian Institutes of higher learning ie, likes of IITs and IIMs, where entrance is purely based on merit. In america, if there is anything then the Ivy leagues have widened the gap between rich and poor, super elites go to Harvard, Yale etc while poor people attend community colleges. Ivy league Tution in America is simply unaffordable. I dont think the writer has any sense of reality about India and US. About that stupid beef incidences, tell me how many gun shoots in schools have happened in the US and why is Obama not being blamed like Modi is being blamed for one lynching which happened in a village where state government was not even BJP! Police, according of to Indian constitution comes under state list. I think this visit is useless,Goals were not fulfilled. Ever since the demise of the Soviet Union in 1991, both the world's surviving superpowers (USA and China) have leaned towards Pakiland. And yet in this period, Pakiland has often struggled rather than strived. What gives, sir? Anon: "Just simple stupid rants. His opinions are not based in reality and facts, many of the middle class and elites in India rub shoulders in Indian Institutes of higher learning ie, likes of IITs and IIMs, where entrance is purely based on merit. " What do they teach at IITs and IIMs? Do they teach history, humanities or liberal arts? Or critical thinking? In fact, the quality of higher education in India is very poor. The quality of education at Indian schools is so poor that Indian kids rank at or near bottom on international tests like PISA and TIMSS. Majumdar: "Ever since the demise of the Soviet Union in 1991, both the world's surviving superpowers (USA and China) have leaned towards Pakiland. And yet in this period, Pakiland has often struggled rather than strived. What gives, sir?" Pakistan suffers from bad governance, massive corruption and rampant violence---all limit its growth and hamper its ability to realize its potential. Poor governance! Too much and unnecessary focus on external "threats" and less attention to internal destructive forces and prudent economic policies. For example. Pakistan, up until 1990, was ahead of India in per capita income (30% 1985) and had much lower poverty rates. Fast forward to 2015, India is 25% higher in PPP per capita income and almost caught up with Pakistan in poverty rates. Note that Pakistan lost a very poor Bangladeh in 1971 but it received a windfall dividend in terms of a lowest poverty rate due to the split! Sushil: "Too much and unnecessary focus on external "threats" and less attention to internal destructive forces and prudent economic policies." Fact: Pakistan's defense spending has gone down from about 8% of GDP in 1990s to less than 3% of GDP now. 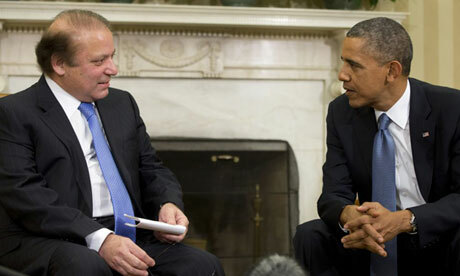 Obama and Sharif expressed their "shared interest in strategic stability in South Asia" in their joint statement. This ignores the fact that China's continuing nuclear and missile relationship with Pakistan makes this a triangular China-Pakistan-India affair and not merely an India-Pakistan one. Moreover, India's nuclear programme is under some agreed constraints as part of the India-US nuclear deal, while that of China and Pakistan are not. Why is the US disregarding these realities and equating India and Pakistan? Obama applauded in the joint statement "Pakistan's role as a key counterterrorism partner". By reiterating "their common resolve to promote peace and stability throughout the region and to counter all forms of extremism and terrorism", Pakistan was made to look good. Worse, Obama made the suppression of extremism and militancy the cooperative responsibility of all South Asian countries, not only that of Pakistan as the source of all these forces. The defining counterterrorism partnership of the 21st century between India and the US is absent from all this. Pakistan uses the excuse of Kashmir for its terrorist onslaught against India, which makes it even more necessary not to pander to its Kashmir fixation. But the US is unable to shed its traditional pro-Pakistan slant on Kashmir. Whereas in 2013, during Nawaz Sharif's Washington visit, Obama supported a "sustained dialogue process" for "resolving all outstanding territorial and other disputes through peaceful means", Kashmir was not specifically mentioned. This time, to satisfy Nawaz Sharif who has been determined to internationalise the Kashmir issue, it was. By calling Kashmir a "dispute", the US is preferring the Pakistani term. To top this, the joint statement calls for an "uninterrupted dialogue in support of peaceful resolution of all outstanding disputes", rejecting implicitly the Indian line that dialogue and terror cannot go together. Most unfortunately, the US has implicitly given credence to Pakistan's outlandish charges against India for supporting terrorism in its territory by emphasising the importance of "working together to address mutual concerns of India and Pakistan regarding terrorism". This equates India and Pakistan on the terrorism issue. Our spokesman has rightly objected to Obama's "support for Pakistan's efforts to secure funding for the Diamer-Bhasha and Dasu dams" in Gilgit-Baltistan, despite calling it "disputed territory". The US should not legitimise Pakistan's illegal occupation of PoK. It is important that even as we engage the US as much as possible in our own interest, we must not lose sight of the ambiguities of America's strategic policies towards us in our region. Washington insiders not sure which Sharif does what. The general has more say in foreign affairs and doesn't need PM's approval in defense and anti terrorist matters. Shanika: "The concern is the checks and balances are not at the level and that may give some congressmen many sleepless nights "
US Congressmen are not naive. They know every country, including their own, has an "establishment" that makes and runs policy. Indian policymaking process surfaced in secret US embassy cables leaked by Wikileaks and published by The Hindu. After a meeting with India's National Security Adviser and former Indian intelligence chief M.K. Narayanan in August 2009, American Ambassador Timothy Roemer concluded that Prime Minister Manmohan Singh was isolated within his own government in his “great belief” in talks and negotiations with Pakistan. In the US, the "establishment" helps shape US policies through its power. IN his book "Who Killed Karakre? ", former Chief of Maharashtra police SM Mushrif has talked about policymaking in India. The power establishment that really runs the affairs of this country (Mushrif says it is not Sonia Gandhi, Manmohan Singh or Rahul Gandhi) does not want to expose the Hindutva terrorists. One example is the blasts in Samjhauta Express, which the IB said was carried out by Pakistan’s ISI. Mushrif quotes a report in The Times of India that said, “the Centre had blamed the ISI on the basis of the IB’s findings.” However, during a narco-analysis test under Karkare, Lt. Col. Purohit had admitted having supplied the RDX used in the blast. The IB, which draws its power from its proximity to the Prime Minister (its director briefs the PM every morning for half an hour), did not want Karkare’s investigation that blew the cover off the IB’s shenanigans, to continue. The Vice Chancellor UET Peshawar Dr. Iftikhar Hussain, announced that the USAID has granted $20 million to UET Peshawar for finding innovative and practical solutions to Pakistan’s energy challenges through USPCASE. He was addressing a high cadre open forum discussion in Peshawar. Dr. Iftikhar Hussain appreciated the efforts of USAID for the socio-economic development of Pakistan through USPCASE and mentioned that UET Peshawar has been doing its bit by helping the USPCASE in identifying the loopholes causing disruptions in Pakistan’s energy sector. He said that UET Peshawar has been proposing better energy solutions to the province as well as to the country. The open forum discussion was organized by the US-Pakistan Center for Advanced Studies in Energy (USPCASE), University of Engineering and Technology UET Peshawar. The ceremony was also graced by the presence of many notable guests including the Khyber Pakhtunkhwa (KP) Assembly Speaker Asad Qaiser himself. Asad Qaiser pointed that the Energy crisis has put KP’s future at stake and needs to be solved on an emergency basis. He appreciated the joint efforts made by UET Peshawar and USPCASE for identifying problems in the field of energy. He also appreciated the KP Government’s initiative to declare the USPCASE as a provincial think tank on the energy sector, further recommending that the (USPCASE) should also work as an advisory board of KP’s Apex Committee on Energy. US–Pakistan Center for Advanced Studies in Energy program (USPCASE) is a USAID-funded program developed for bridging the gap between three of the most important pawns of state, namely academia, state and industry. The USPCASE has directed all of his efforts in applied research explicitly relevant to Pakistan’s energy needs. USAID is funding $127 million and has made to partner four Pakistani universities with three U.S. universities. It is supporting Pakistan for research in areas such as energy, water, agriculture, and food security through USPCASE. The United States exported $1.8 billion in goods to Pakistan in 2015, creating or supporting over 9,200 U.S. jobs according to the U.S. Department of Commerce. As one example, in 2016, General Electric won a contract to provide 55 locomotives to Pakistan Railways, all of which will be manufactured in Erie, Pennsylvania. Foreign direct investment from Pakistan to the United States in 2015 supported up to 1,000 additional U.S. jobs. The United States and Pakistan launched the U.S.-Pakistan Clean Energy Partnership in 2015, which supports private investment in financially sound, clean energy projects in Pakistan. The Partnership aims to add at least 3,000 megawatts of clean power in Pakistan by 2020, creating opportunities for U.S. businesses across the clean energy spectrum. In 2016, the U.S. Department of Agriculture (USDA) hosted a Pakistani group of Cochran and Borlaug Fellows to study the benefits of using U.S. wood products. USDA connects U.S. and Pakistani scientists to jointly develop varieties of seeds that will resist diseases that threaten both U.S. and Pakistani cotton and wheat production. Since 2005, grants co-financed by both countries under the U.S.-Pakistan Science and Technology Cooperation Agreement have funded 96 research projects in a variety of scientific areas. Researchers from the University of Agriculture, Faisalabad and the University of California at Davis are developing a low-cost, blood-based Tuberculosis (TB) diagnostic test—more sensitive than the current World Health Organization-recommended sputum test—that is undergoing trials in Chennai, India to prepare for approval and commercial launch of the test in India. This test could eventually enable patients testing positive for TB to undergo effective treatment sooner for a highly damaging disease affecting populations across multiple TB-endemic countries. Researchers at the University of Michigan at Dearborn and the University of Engineering and Technology (UET) in Lahore are collaborating to develop air quality monitoring that can be applied to mobile and wireless devices. This new area of research aims to improve air quality in polluted urban areas in both countries, and possibly soil and water quality in future applications. 23 U.S. universities from 16 states and the District of Columbia have received grants to work with counterpart Pakistani universities in fields ranging from business development to gender studies.